Just another Lifestyle Blog with some parenting and humour thrown in. 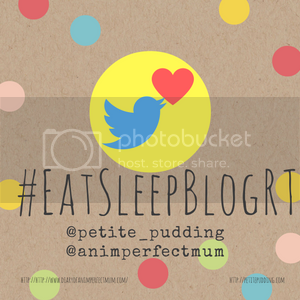 Welcome to the #EatSleepBlogRT linky! We know there are loads of linky’s out there so we have designed this one to help drive more traffic to your blog by asking people to retweet posts on Twitter as well as to comment. As hosts we will retweet your blog when you link up and when we comment. So that is 4 retweets already! Sharing is caring so the more retweets you do the better. The person with the most shares on social media will also get a backlink the following week. Linky runs from 8pm Sunday until 8pm Tuesday. Please put our lovely badge on so that we can show off its fabulous design! Comment on the post before yours. Hosts will retweet when you link up (if you tag us in your tweet) and when we comment. A Host will comment on all posts linked up. Simple right? Lets get out there and set the Twitter world alight with our blog sharing!